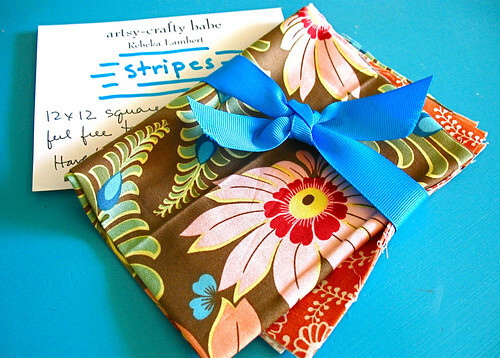 Twelve by twelve - Stop staring and start sewing! I was so excited to be invited by Beki to join a group of twelve bloggers making twelve quilt blocks (size 12x12) over a twelve month period (did you get that?). We even have a blog! Now I'm not much of a quilter so I hope I can keep up but I figured I can do one block a month without causing too much trouble. Beki went first and she sent me (and the other 11 gals) this beautiful Amy Butler fabric (out of print, so I tried to be very careful!) and asked for "stripes". 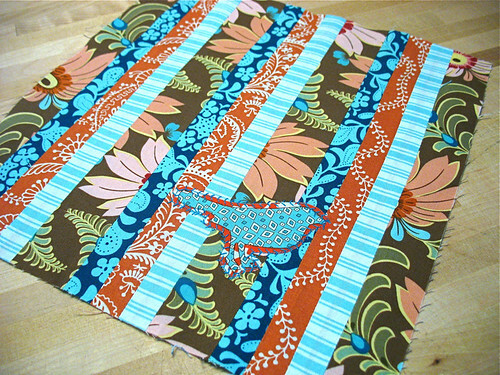 She said I could add my own fabric and since I'm on a turquoise kick I added this pretty teal Farmer's Market print and a sweet stripe from the Ava Rose collection. I was a little bored with it so I decided to add this little bird from my precious scrap of the Summer in the City fabric (why does Moda only print one run of these great fabrics? Sniff.). I hope she likes it! 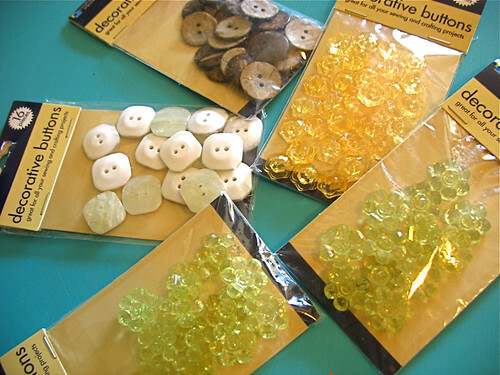 I saw these great beads and felt cutouts on Beki's blog and I finally ran down to Dollar Tree and grabbed some. 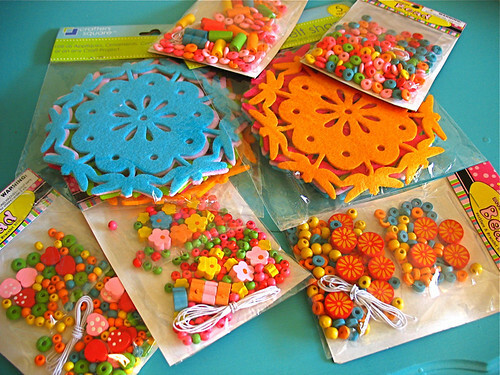 I'll probably use them for Christmas crafts but they're fun just to look at for now. They also had a great selection of fun buttons so I grabbed a bunch (funny how those "it's just a dollar"s start adding up!). The brown ones are really nice. They're made from some sort of wood or nut shell or something like that. The green and yellow ones are fun and sparkly. And I have Mary Engelbreit's Recipe for Friendship in the store. It's so pretty and I wish I had time to play with it but I've been kind of busy (one week to Quilt Market!). 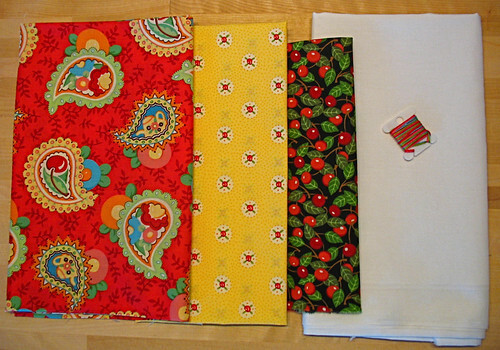 I did put together an Edith Twirl Skirt kit with some of my favorite fabrics from the line. I really love these chubby paisleys! They're 4 inches long so you can see the details without it being too big. Super cute! I keep checking for any updates on the Home Companion's quest for a new publisher. I dropped them a love note here so hopefully they will be moved to find someone fast! Have a great rest of the week!